I know at least one person who reads this blog really loves goats, so, if you are this person or another person who feels this way, you may want to stop reading now. Still reading? Ok, you've been warned. Thanks to Giggles and the faulty sun visor in her Prius, we found a gem today on a sleepy little road in El Monte. In other words, if you ever get your car serviced at Longo Toyota, you should stop by here. 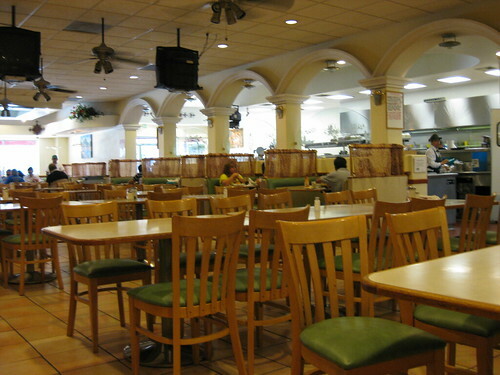 La Barca Jalisco (10817 Valley Mall, El Monte) is a birrieria, which is sort of odd because you'd think a place with "boat" in its name would specialize in seafood. 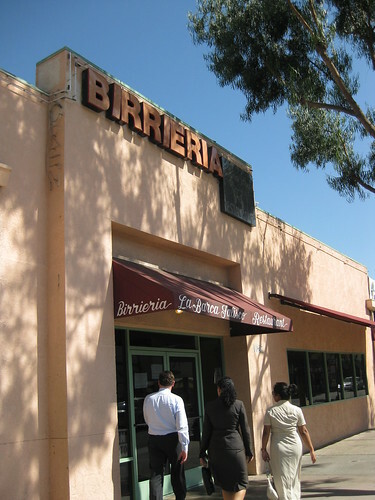 A birrieria sells birria, just like a panaderia sells pan, a carniceria sells carne, and a tortilleria sells tortillas. The unassuming small storefront is deceptive. 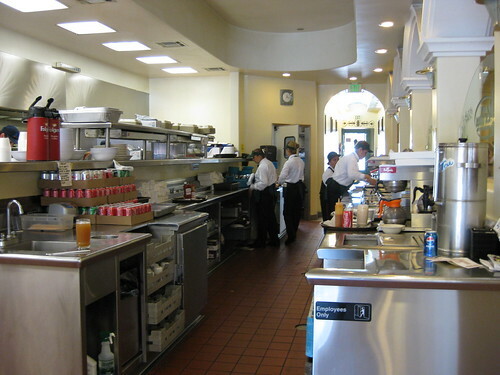 Open the door, and you see a giant kitchen and an even larger cafeteria-like dining area. Everyone speaks only Spanish. This place is beyond legit. 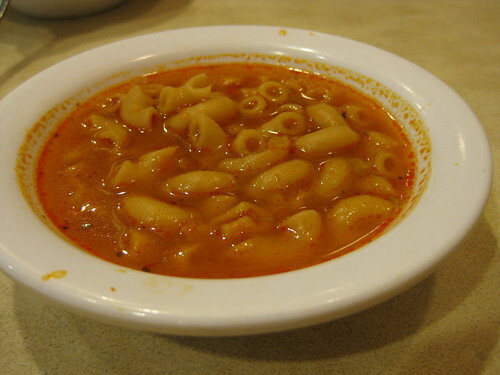 Almost as soon as you sit down, a happy busboy plops down these little complimentary bowls of savory tomato-based macaroni. It's like a yummier Mexican version of Chef Boyardee. 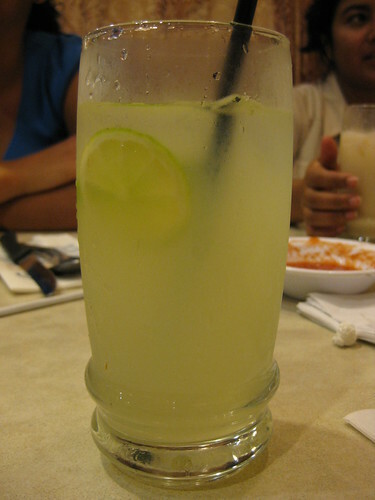 My fresh lemonade with a hint of lime ($1.65) rocked. Lip-smackingly good. If you haven't guessed already, birria is goat. And it's marvelous. 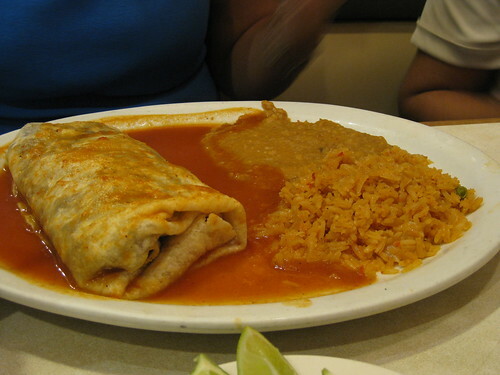 Tennessee and I went halfsies on two dishes, including this massive birria burrito ($9.99). 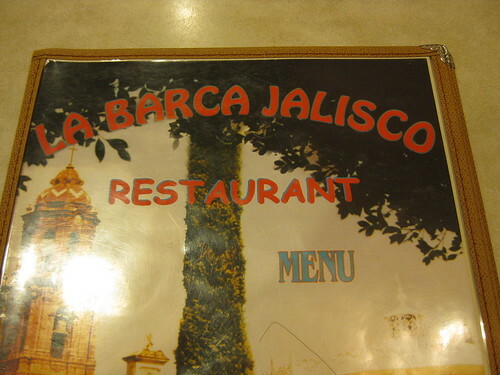 The meat was tender, rich, seasoned with fresh mole, and topped with a tomato salsa and over 20 different ingredients. Stewlicious. Really good stuff, but, if you're not into goat, there is a beef version, too, which may actually be even more delicious. We all loved Giggles' beef version. However, we couldn't go to a birrieria and not get birria! 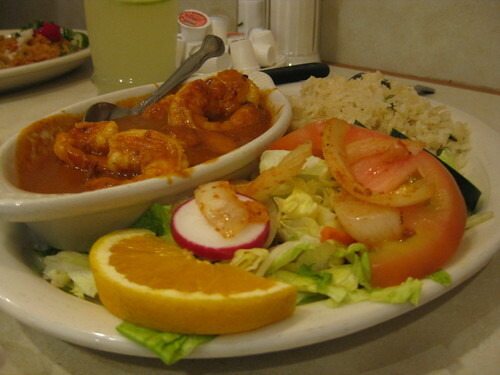 Wienerdude opted for a camarones diablo dish, which he said was great. But the most impressive entree today was something possibly even more out-of-the-ordinary than stewed goat -- codorniz frita ($9.99). 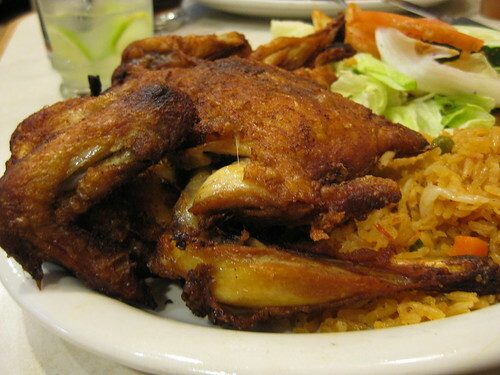 For the Spanish-illiterate, that's fried quail. Fanfuckingtastic! So good it requires profanity! Imagine the best tiny fried chicken ever -- golden and crispy on the outside and succulent on the inside -- and you have this. But slightly different. And awesome. I wasn't able to finish my portion, so I took it to go. Even after five hours in an office refrigerator, it still smelled incredible as I toted my takeout box to my car. I was rather tempted to just sit on the sidewalk and gnaw on my leftovers like a crazy person, but I resisted. Mr. Monkey had quite the nice little snack tonight. Sharing is caring. Caring is codorniz frita. So sad I missed out on this! I love good birria. One corection though--"barca" as opposed to "barco" means to purify or make perfect. This is a perfect name for a birreria because if chivo is not prepared properly (ie. It is not "purified" or made "perfectly"), it can make you quite ill. There is some sort of gland or something that releases bacteria into the meat when birria is not made right. 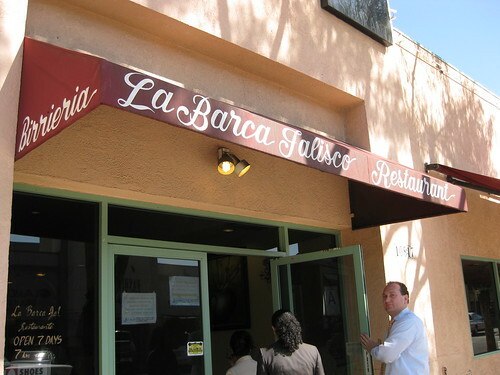 My understanding is that few places have perfected this art, so for that reason, many people are afraid to try a birria at a place they are not familiar with. I just checked with my family experts and have to correct myself. I was confusing two things: The "gland" I was thinking off is actually the gall bladder and it won't make you sick if you accidentally cut into it, it just makes the meat bitter and awful. The fear of getting sick is based on undercooking of the meat--it MUST be completely well done. I don't think I've ever had goat before. I think I've had quail at Chinese restaurants before though. Hmmmm I love all of your food adventures. I can honestly say I've never had goat and have never even thought of having goat. for some reason i imagine goat meat being tough and gamey. maybe it's because i unfairly assume the goat to be a bitter, unhappy animal. :-/ i woulda gone with the camarones. Well, it definitely *looks* good. However, I think giggles option is about more my speed. I haven't had goat in years. It's pretty common in Nigerian cuisine (I'm half). The meat is an acquired taste though. Good birria is definitely hard to make because of exactly what Glam mentioned. I was going to correct you on the boat thing but I see you have your resident Latina helping you out! Ok, so I'm not going to eat the goat. Sorry. But I am CRUSHED to have missed this outing because I'd definitely eat the beef/quail/other non-goat items. Pleeeeease, pretty please, take me with you next time you go ;-) I will even break Giggles' sun screen again if it means another trip. I'm drooling over that last picture. Looks so good. I've actually had goat before! But I've never had quail. It sounds good, though. I've eaten here before, but I obviously ordered the wrong stuff. 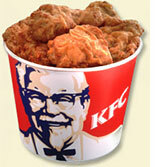 That fried quail looks pretty finger lickin' good. I'll definitely go back. Thank you for the warning. I did not read this blog. I did not look at the pictures. I did not read the comments. I just scrolled down as fast as I could to let you know that I REALLY appreciated the warning. Thanks. soooooo...the tomato/mac soup looks good. Goat is one of those meats I've never eaten, and while I might eat it in a country where it was their national dish, I can't see myself eating it here. Not that I have anything against, goats, for some reason I just think it would taste like dark meat chicken - and that's not my favorite. If you want another style of yummy goat, try the Tibet Nepal House on Holly Street in Pasadena. Amazing food there, and the goat is really good (the yak, however, is not so yummy). Um, I was one of the ones that had to stop reading. don't know that goat would be my first choice for a meal, but i didn't think i'd like rabbit either and i was proven wrong on that account. the macaroni and tomato look yummy, too. Ooh, this place sounds yummy! El Monte GTG, anyone?